The paper "Are Wives less Selfish than their Husbands? Evidence from Hawk-Dove Game Field Experiments" written by Stein Holden and Sosina Bezu is now published as a CLTS Working Paper. 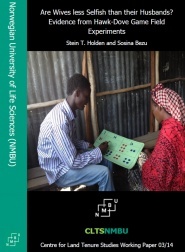 Lab-in-the-field Hawk-Dove game experiments were played by spouses in a rural sample of households in Southern Ethiopia where women/wives traditionally have a weak position. Randomized treatments included a 3x3 design with simultaneous, one-way signaling and sequential games as the first dimension and Pareto-efficient, Pareto-inferior and Pareto-superior (Dove;Dove) payout treatments as the second dimension, with a sequence of six game rounds per household. The experiments allow for the assessment of the presence of alternative player types, such as players that prioritize household income maximization, players that prioritize personal income, players that are Hawkish and punish their spouse at their own expense, and cooperative reciprocators (Doves) who cooperate even at the expense of household and personal income. The experiments revealed that all player types were present in the sample. Husbands played significantly less Hawkish than their wives and played gradually less Hawkish over the six game rounds, whereas wives remained Hawkish.